What follows is an assessment of the Islamic State of Iraq and the Levant (ISIL) from a socio-cultural perspective. We have employed a modified PMESII-PT framework for analysis (Political, Military, Economic, Social, Infrastructure, Information, Physical Terrain, Time). We have modified PMESII-PT in three ways to emphasize the socio-cultural aspect of this analysis. First, we have expanded the concept of Military to cover all coercive forces in the area of interest. The expanded category includes law enforcement, pro and anti-government paramilitaries, militias, external forces, etc. Second, we added Population and Culture as separate categories. Arguably, these categories could be covered in PMESII-PT under Society, but we saw them as sufficiently important to merit separate chapters. Third, we have expanded the concept of Information, which we have titled Communications, to account for both how information is communicated and how it is received within the society under analysis. With that as background, here is a synopsis of our major findings by category in our modified PMESII-PT framework. POLITICAL: ISIL has developed a political system in the image of the 7th Century Islamic Caliphate, which includes executive and judicial branches of government, but not a legislative branch. The legislative branch was unnecessary because Sharia is interpreted from the original religious sources, not created. In the ISIL system the executive branch interprets Sharia and communicates its interpretation to the greater organization. The judicial branch oversees the implementation of the executive’s interpretation of Sharia law by means of multilayered security and legal systems. SECURITY: ISIL has concentrated power in its military and state security apparatus in order to expand its dominion to areas outside its current control and enforce its interpretation of Sharia within its territories. In order to weaken resolve in areas outside its control and to gain compliance in areas it controls, ISIL has created a culture of terror through the institutionalized use of local and media based public spectacles of primordial violence. ECONOMIC: ISIL has a rentier economy, which derives a significant portion of its revenues from the sale of oil and gas to external clients. ISIL’s total cash and assets are estimated in the billions of dollars. Despite recent financial setbacks, ISIL has sufficient funds to maintain, or even expand, its security forces. As long as its security forces are effective, and in the absence of outside opposition, ISIL will continue to control its current territory. At its current funding rate ISIL can fight a holding action in the Levant while continuing to export terror to the rest of the world. 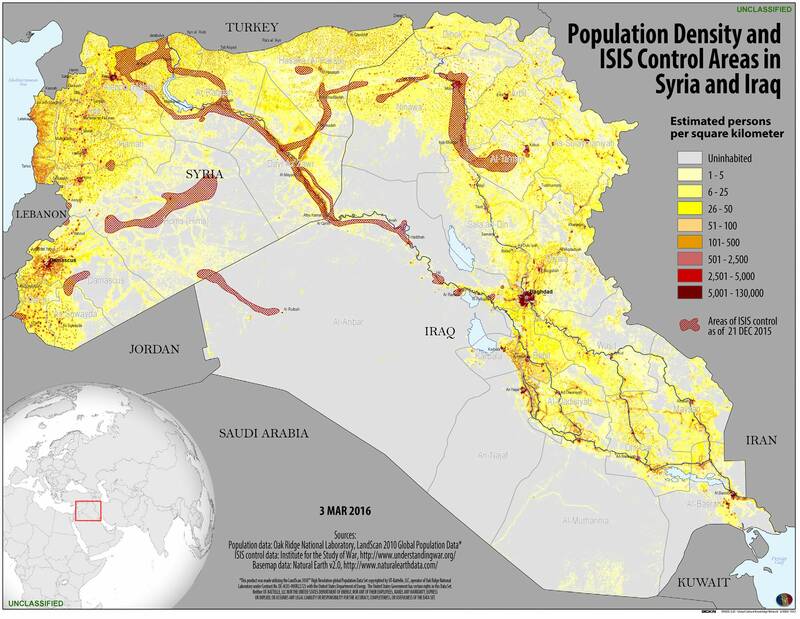 POPULATION: The population of ISIL-controlled territories is estimated at between six and eight million people. An estimated ten to twelve million people have fled from ISIL territory and adjacent regions affected by the Syrian Civil War. The conflict in the region has been devastating to the population, which is suffering excessive unemployment, food scarcity, economic paralyses, and generalized poverty. The vast amount of displaced persons is straining Iraqi and international humanitarian relief efforts. SOCIETY: ISIL is an autocracy superimposed on top of tribal society, which by its nature is the antithesis of an autocracy. Social identity in ISIL-controlled areas is derived from three identity parameters (Arab, Muslim, and Sunni) shared by the general population. Historically, tribal affiliation has been the primary determinant of social status in both Syria and Iraq, but ISIL has altered this by elevating its members, many of whom are former Baathists, and foreign fighters to the upper echelons of ISIL society. ISIL further undermined the Sunni tribal leaders by usurping the economic means of production and distribution. CULTURE: ISIL’s cultural folklore envisions a return to a 7th Century Islamic “Golden Age” when the original “pure” Caliphate ruled the Arabian Peninsula. The past is portrayed as an Islamic Eden unspoiled by infidels or apostates. ISIL narratives describe a final apocalypse in which the retrogressive forces of Islam triumph over the progressive, corrupted, non-believers of modernity, creating a new world order. This vision animates ISIL’s actions. ISIL justifies its brutality, deviation from traditional Islamic values regarding women, and crimes against humanity as service to the state. Because the Islamic State is everything, it follows that survival of the Islamic State is paramount. Based on ISIL’s actions when threatened with defeat in Iraq, if the situation in the Levant becomes untenable, ISIL leaders will most likely seek to relocate to a location, such as Libya, where they can continue their jihad. INFRASTRUCTURE: To date, ISIL has shown the ability to maintain its physical infrastructure at an acceptable level of functionality, although its infrastructure has certainly deteriorated due to years of war and neglect. How long ISIL can continue to maintain its infrastructure is uncertain, particularly in light of ISIL’s recent drop in revenue and Coalition bombing. ISIL has employed a “scorched-earth” policy by destroying the infrastructure when driven out of urban or rural areas. ISIL will most likely continue this policy, if and when it has to cede more territory. COMMUNICATIONS: ISIL has developed an almost textbook information operations campaign using all mediums of communications at its disposal to further its strategic goal of establishing a Caliphate. Using symbols and assorted media, ISIL is employing a multi-layered communications strategy to promote its ideology, secure its base, attract foreign fighters, create affiliates, and turn Muslim public opinion against the West. 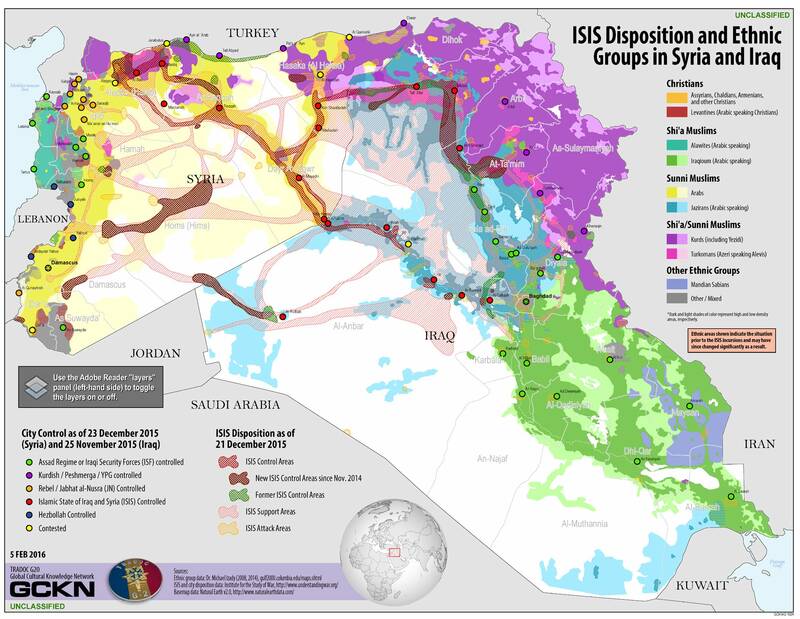 GEOGRAPHY: In terms of the physical geography, ISIL occupies an area with very narrow and linear habitable areas generally surrounded by vast expanses of desert. Because of the desert terrain and lack of significant rainfall, life in the region is almost entirely dependent on the Tigris-Euphrates river system.